From the moment you step into the newest gym in Reading, there’s no doubt you have entered a Planet Fitness. More than 100 pieces of equipment are emblazoned with the chain’s purple and yellow logo. Bottled water available near the front desk is branded with the Planet Fitness name. Franchise owner Taylor Mandell even wears a violet shirt as he gives a tour of the facility, though he swears the color choice is purely coincidental. These brightly colored gyms — and their enthusiastic fans — have become an increasingly common sight in recent years, as the Newington, N.H.-based Planet Fitness continues its rapid expansion across the country. At the end of 2008, the chain operated at 242 locations; today the count is 636, an increase of more than 160 percent. 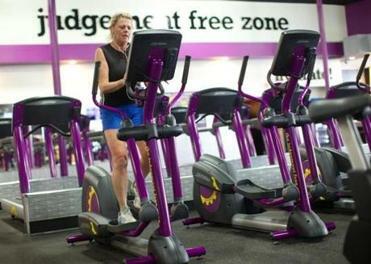 In Massachusetts, new Planet Fitness franchises have opened recently in Reading, Andover, and Shrewsbury. Cristina Winsor of Wakefield worked out at the Planet Fitness in Reading. “I do like the no-judgment feeling,” she said. Company executives, franchise owners, and members all say the key to that growth is the unusual environment inside Planet Fitness facilities. The company aims to serve people who have never belonged to a gym, promising them a “judgment-free zone,” where behavior that might intimidate workout novices — grunting, posing, dropping weights — is strictly prohibited. Free pizza is offered on the first Monday of every month. The clubs forgo frills like pools and saunas, and keep the price low — just $10 per month for a basic membership. To ensure that members of all fitness levels feel welcome, Planet Fitness enforces its rules with a “lunk alarm,” a flashing blue light and accompanying siren installed in all clubs to call out those engaging in prohibited behavior. “It’s great — it keeps everybody in check,” said Cristina Winsor of Wakefield, who was working out recently at the Reading club. Winsor, who did not belong to another gym before she joined Planet Fitness, appreciates the atmosphere and people at her new club. 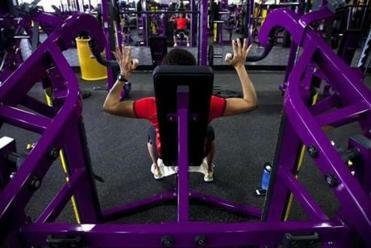 Planet Fitness membership has grown by nearly 50 percent since 2011, to 4.3 million members. Some, however, question the sincerity of the company’s message. The chain’s antilunk policy discriminates against a certain kind of gym-goer, undermining the claim that Planet Fitness is a place where you will not be judged, said former club member David Hovsepian of Allston. And serving pizza is at odds with the goals of working out, he said. “There’s a lot of hypocrisy, and I think at the gym they don’t necessarily promote anything healthy,” he said. Complaints like these, however, are in the minority, and the company’s success shows that there are plenty of people who appreciate the Planet Fitness approach, Rondeau said. The company’s winning formula was born more than 20 years ago. Only about 12 percent of people nationwide belonged to a gym when the company opened its first fitness center in Dover, N.H., in 1992. Rather than compete for a slice of that limited market, Rondeau said he and his partners decided to go after the other 88 percent. The “lunk alarm” enforces the gym’s rules. The plan worked well enough that they were able to open three more gyms over the next decade. Then, they hit a wall. They wanted to open more clubs, but didn’t have enough money to keep expanding, Rondeau said. So they decided to franchise, rather than add more company-owned locations. That strategy sparked a decade of steady expansion. “In the economy that we’re in, there are so many companies that are downsizing, cutting back, and Planet Fitness is growing by leaps and bounds,” said Mandell, who is a partner in five franchise locations throughout northeast Massachusetts and plans to open another six. To open a Planet Fitness, investors must have a total net worth of at least $1.5 million and at least $500,000 in liquid assets, according to the company’s website. Last year, the Planet Fitness franchising approach attracted the attention of TSG Consumer Partners, a California private equity firm that bought a majority interest in the company. Megan Relihan of Lynnfield worked out on an elliptical machine. One industry analyst said gym membership is increasingly seen as a necessity, rather than a luxury. Right now, Planet Fitness seems to be riding an industry trend. Gym membership is increasingly seen as a necessity, rather than a luxury, said Dale Schmidt, fitness industry analyst for market research firm IBISWorld in Santa Monica, Calif. But people are reluctant to pay for perks they have no interest in using. Planet Fitness hopes to be part of that growth. Rondeau said he expects the company to expand to more than 700 locations nationwide by the end of the year. Over the next two years, the company will consider opening clubs in Canada, Central America, and South America. For Mandell, it is clear why the chain is thriving: It all comes down to the members, he said.